Google & Amazon have just promoted the HelluvaCook blog to "affiliate" status! What this means is that I can link directly to products relevant to the posts and, if my visitors go through with purchasing an item, I get a kickback! How cool is that?!? Click here to see a little more about how it works! 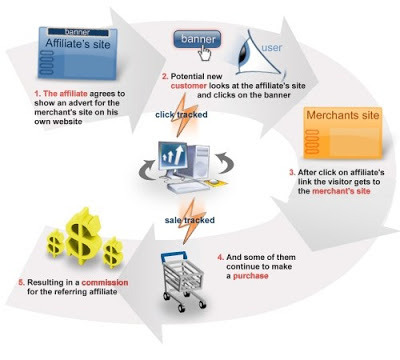 As shown in the graphic above, the affiliate marketing program is pretty straight-forward! If you are considering purchasing an item anyway, why not go through the link I've posted directly on the blog?? I'll try to link to the best deal for each item on the Net, so you might as well save yourself some time and energy and buy it online instead of making a trek out to the store! "Why is he doing this? ", you may be wondering. Mostly because the next step is actual sponsorship!! If I get enough visitors to the site & speak highly of the products I like the most, the manufacturers of said products may choose to sponsor my blog so that I can draw in more visitors with lots of posts, promotions, and events! So, please consider checking out the links I put up within the posts! I wouldn't recommend something that I wouldn't personally use, nor would I intentionally steer anyone in the wrong direction!